Balancing Jane: My Students are Not My "Customers"
During a day of peer review, I sat at the front of the classroom watching students critique each other's papers. For once, things were going smoothly, and I prefer not to intervene unless it's necessary. The point of peer review is that they hear from each other, so as long as they're on topic and being polite, I try to leave them alone. Things were going so well that I pulled out a stack of in-class writings to grade while they worked*. From the back of the room, a student who had a habit of being verbally disruptive in class called out, "What do you have up there?" Not knowing he was even talking to me, I continued grading. He then called out again, "Hey, teacher, what you have there?" I looked up, puzzled, replied with a simple, "Papers, but why don't you worry about what you're working on?" He then said, "Papers for this class? Because you're on our dime, so it better be for this class." I was taken aback by his rudeness, but I stayed calm and told him, "You worry about what you're doing. I'll worry about what I'm doing." He didn't say any more, and I talked to him about appropriate classroom behavior after class. His attitude, though, and the idea that I was "on his dime" is one that is becoming increasingly popular on college campuses. Students are now seen as "customers." The buzz word is everywhere. College staff wear IDs to provide better "customer service" and campuses need to adapt to their "customer's needs." I have no problem with campuses adapting to meet students or people wearing ID badges to be identifiable for students, but I have a big problem with those things happening for "customers." I worked in customer service. I was a "customer service manager" for a big retail store during undergrad. I have served beer and burgers and cleared tables. I have handed sacks of greasy fries and milkshakes out drive-thru windows. I know a lot about the relationship employees have to "customers." Customers are something to placate, to nod and smile at through gritted teeth, sometimes to fear. As a cashier, I was frequently screamed at by customers and unable to do anything about it for fear of losing my job. A customer once gave me a ten-minute lecture for "squishing" his bag of spinach (when all I did was place it at the top while bagging his groceries). A drunken customer once leaned over a service desk counter and took a swing at me. Customers have cussed me out, blamed me for things I didn't do, and threatened me. Of course, these were not the majority of customers. 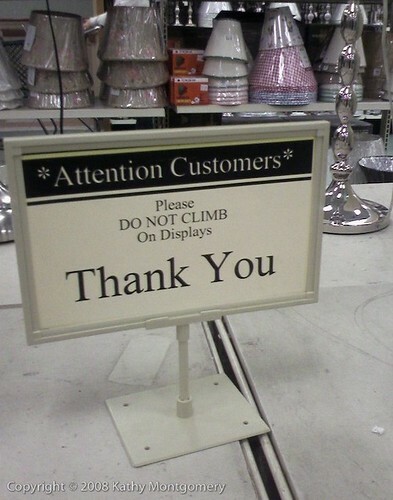 Most customers were perfectly fine people. Many were even polite, amazing people. Some customers made even a day slinging burgers feel worthwhile and fun. But the thing about customers is that they have the power, and everyone in the relationship knows it. "The customer is always right" is a cliche for a reason. They are bringing their business into an establishment and the employees within that establishment are merely a means to an end, a delivery system for the product. That cannot be what teaching is. My customers saw me as subordinate to them. My students need to see me as someone with knowledge and experience they can learn from. My customers saw me as a means to an end. My students need to see me as a collaborator in their accrual of knowledge. My customers saw me as someone who could be threatened by their displeasure. My students need to see me as someone who cannot be knocked down by their displeasure, especially when that displeasure is about the standards for classroom performance or behavior. Effective teaching is first and foremost a relationship. Those relationships differ because of individual's teaching philosophies and particular sets of students. Some teachers may see themselves as authorities on their subjects while others view themselves as collaborators. Some teachers may waver between different relational vantage points throughout their career or even throughout their day. But underlying all of these styles is a relationship between students and teachers based on mutual respect and shared goals that involves a bilateral growth. In effective teaching, teachers become better teachers, students become better students, and everyone becomes a better person. That effective, mutual relationship does not happen when students are viewed as "customers." I've had customers, and I've had students. I assure you that you do not want me confusing the two. *Edited to add: This post is getting a lot more traffic than I anticipated, and I've seen some comments about it on some of the sites it's being shared. I don't mind criticism, but I want to be clear that I don't "just sit in front of my students and grade papers." I have a hard time just letting students be during peer review, and I know from experience and research that giving them the room to breathe during that particular classroom activity after designing it and implementing it is the best course of action. I was looking at the papers for maybe five to seven minutes out of an hour and fifteen minute class so that I wouldn't be hovering at students' elbows as they tried to do the work they needed to be doing. I was present and immediately reactive to any questions from any of the groups as they worked. I very much value the time that I have in the classroom and would never see it as an opportunity to do "busy work" while my students suffer the consequences of an ineffective classroom. My classroom is an active place full of a combination of discussion, lecture, group work, and silent writing. Sometimes my classes work better than others, but I am always an engaged participant in the environment. I used this particular example because I thought it captured the tone well (the student saying I was "on his dime"), not because I think students should keep themselves busy while I do other work. Update: After the conversation this post has generated, I wrote a follow-up post to bring in some other voices. I work in admissions and the customer service concept is perfect for us. We have to be kind friendly and care about meeting the needs of our prospective students and families with the understanding that the student are buying into a system. So instead of the University providing a product to an end user, perhaps the relationship is more akin to an individual become a multi-level marketing sales person. The University provides the resources and the mentors, the students have to "work" the plan. How much of this would you expect that this is do to consumerism? I think that it makes a little more sense to have a customer service model on the admissions end, but I think you're right that it's more of a multi-level plan. Students have to see themselves as an active "worker" in their own education. They cannot see themselves as customers who paid to get passively filled up with knowledge. Yep. I saw the phrase "customer service" in an email. On the Friday before spring break. Is the issue that students shouldn't be treated like customers, or is that... no customers anywhere should have the power and entitlement they often have over employees? Because to me it's not "teachers don't deserve to be treated the way waitresses are, because being subordinate to their students is bad for the student" but rather, "teachers AND waitresses shouldn't be treated as subordinate to students and customers, because it's foremost harmful to the waitresses and teachers." For you and I and a lot of other college-educated people, the subordinate employee-customer relationships are a temporary thing to be suffered through. Some people will work under that situation though, for their entire lives. That is really not a trait of society that I want to perpetuate. People don't become any less human when they put on a smock or a nametag. (And I'm not trying to imply you think that; clearly you've been on the receiving end and know how it is) but I do think it would be helpful to examine this in the light of your customer-service/cashier experiences as well. Undoubtedly, being treated like dirt probably impacts the quality of the service low-status employees give customers, hurting the business and the customers. I have known people that laughed when they "accidentally" broke company property, or gave customers expired food to eat, all because they grew to hate the company so much because of the way they were treated by customers and management. Look at the Walmart worker who was fired only after he finally Youtubed himself hurling iPads (which cost quite a lot of money, I think) onto the stockroom floors for fun. How much did that cost customers (who's iPads probably gave up the ghost quicker than more gently-treated ones), the company (in bad PR, and returns) and the manufacturers, before he was finally caught? I think it's in society's best interest to change the customer-employee relationship in every field, because it's hurting a lot of people. Excellent points! I certainly don't think that employees deserve the mistreatment that they receive (and I certainly don't look at those people as less than myself when I interact with them, especially since most of the people in my family work exactly those types of jobs that I used to work). I do think, though, that the power dynamic is different even if we managed to get rid of the abuse and mistreatment. Customers have a sense of (sometimes rightful) entitlement of having purchased a specific experience. I don't think that we can give students that same benefit. While, as teachers, we should plan our classes in ways that have the students' best interests and learning styles in mind, we can't let individual students dictate what type of experience they plan to have in the classroom. I've had students tell me that they can't do homework on weekends because it interferes with their plans or take an entire week of classes off because they went on vacation and get upset that I won't sit down with them privately to re-discuss everything they missed. If I purchase a hotel room, I have the right to control the temperature and wake up when I want to (as long as it's before check-out time, which is when my purchase ends). Students, though, can't have that kind of control, and calling them "customers" can make it seem like they should. I COMPLETELY agree with you that we should end the classism in the customer-employee relationship that hurts everyone (as your example with the WalMart employee points out well). Even if we did that, though, I still don't think students should be seen as customers. I don't know. Consumerism is engulfing a lot of things, and as someone pointed out earlier, the things consumers are paying for include "experiences." They seem to include experiences that would once have been apprenticeships, as there are places for yuppies or the income equivalent to pay for hands-on experience in winemaking or guitar lutherie or some other kraft. As for going to school, if the actual official name of your major is a job title like "medical assistant" (as opposed to, say, "medical assisting") or "physical therapy assistant" or "medical transcriptionist" then your schooling probably has the look and feel of a J.O.B. (i.e. being treated a lot more like an employee than like a customer), complete with attendance tracking, a dress code, etc., and of course the tone of the program being at least as much about enculturation as about learning. If you are in one of those "adult" master's degree programs in the liberal arts, you're probably being treated as a customer from the way you're marketed to on the intake to the way you're delivered the merchandise (the diploma) at the end. The O.P. paints a picture of a PhD student (so says the masthead) who has paid hard dues in some of the suckier parts of the servant sector, and undergraduates who, at the very cusp of adulthood, are already being encouraged (by this misguided emphasis on customer service) to be the kind of customers who habitually intimidate a certain level of service out of a certain class of people. It the point that some people are on a life track of serving, while others are on the "being served" track, or is the point that some people are missing out on key portions of the maturation process? I'm guessing some of the students really do have the clout to get away with it indefinitely, while others are in for a rude awakening. "My students need to see me as someone who cannot be knocked down by displeasure, especially when that displeasure is about the standards for classroom performance or behavior." Have you ever had a student threaten to get you fired? From what I have heard, it usually goes something along the lines of a student being upset about something (poor grade, disciplinary problem, etc. ), then accosting the teacher and saying "I can get you fired just by ......". This student is usually a different gender (or gender preference), different race or belief system, or something different - and that difference is used as a weapon against you. Yes, there are all sorts of rules about not being alone with a student, etc., but realistically, that's usually not possible 24/7, and some careers have been threatened/lost because of false accusations. My point in all this is that while we DO need to take accusations seriously, we probably should not have an automatic knee-jerk response, and a fair and balanced investigation should occur. Then if the allegations are proved false, I would suggest that some form of consequence (I am not saying "punishment") happen to the person that knowingly made a false accusation. Hopefully, the administration would be balanced, and back the teacher when necessary - something which doesn't necessarily occur in all schools. Long-winded, I know, but do you have any thoughts on this? I guess what I was trying to say with my prose is that we as teachers SHOULD be difficult (or impossible) to be knocked down by a student's displeasure. But from what I see/hear I'm not sure how realistic that is. Thanks! Hi Rick, I have definitely heard about the types of situations you're talking about. I guess--for me--the thing is that students can be displeased without being mistreated or discriminated against. There are, unfortunately, incidents where teachers truly do mistreat a student. There has to be a way for students to be heard when that happens. I think that the customer service conversation makes it harder to differentiate between things students don't like and things that teachers shouldn't do. Tough grading, attendance policies, and not allowing cell phones in the classroom are all tools that teachers should be able to use that might displease students. If we talk about students as "customers," it's harder to demonstrate where the lines are, so I think that the model actually hurts students as much as it hurts teachers. I think the way this impacts the classroom will vary greatly depending on what kind of support systems are in place for both teachers and students. And you said it much better than I did. :) "If we talk about the students as 'customers'...the model actually hurts students as much as it hurts teachers". I think it's a no-win situation, because it's too easy to abuse that kind of system, and the power shifts around too much. It is strange to hear that you do not think of your students as customers. You appear to be drawing your own conclusions about what having that type of relationship would include -- as opposed to explaining the bounds of your particular contract with the student; regardless of the class your teaching doing so (imho) would serve the situation better. The discussion could have fostered so much more than resentment -- I also can't help but wonder what feelings are really being represented in his 'outburst'.?! The bounds of my relationship and contract are defined by pedagogical theory, much of which is sponsored and required by my employers (the college). I am not haphazardly defining my own position. I care deeply about my profession and take seriously all of the workshops and conferences I attend that talk about the student-teacher relationship as a collaborative learning process. It is also the relationship that I have seen actually work in the classroom. My primary goal--every single day--is to help my students gain the knowledge and skills they need to do the things they want to do in life. I do that because I care about them as human beings, not because I see them as customers from whom I can profit. Thank you for this excellent topic. My response to the original scenario is that you did right by discussing classroom behavior with the student after class. If he has a concern, he should speak with you privately, not call you out in a disprespectful way. Many of us need to learn this because it doesn't just happen in student-teacher interactions.